Miranda Lambert poses in the press room with the milestone award and the awards for song of the year for "Automatic", album of the year for "Platinum" and female vocalist of the year at the 50th annual Academy of Country Music Awards at AT&T Stadium, April 19, 2015, in Arlington, Texas. 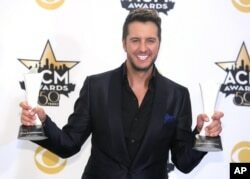 Luke Bryan poses in the press room with the awards for entertainer of the year and vocal event of the year at the 50th annual Academy of Country Music Awards at AT&T Stadium, April 19, 2015, in Arlington, Texas. Luke Bryan won the fan-voted top prize of entertainer of the year at the 50th Academy of Country Music Awards on Sunday, which drew more than 70,000 fans to the AT&T Stadium in Arlington, Texas. “It's good to be home,” said Lambert, a native Texan. George Strait, who retired from touring with a final show at Cowboys' Stadium last year, debuted his new single, “Let it Go” after performing a medley of his greatest hits. Little Big Town, whose latest single “Girl Crush,” has drummed up controversy over how it depicts post-breakup jealousy, won for vocal group of the year. “We really wanted to bring big hair back to country music,” said singer Karen Fairchild. Alan Jackson performed his Grammy-winning hit “Where Were You (When the World Stopped Turning)”, a song he wrote in honor of the 20th anniversary of the Oklahoma City bombing. The Academy of Country Music honors big stars as well as small market radio disk jockeys and concert promoters, and the awards are voted on by members of the Encino, California-based professional organization.